There aren't many small towns in the U.S. with two printed newspapers. For a while, there was one fewer. Now the Homer Tribune has resumed print publication, joining the Homer News in serving Homer, Alaska, a fishing-and-tourism town of 5,000 at one end of the nation's paved road system. Both regularly win awards from the Alaska Press Club. 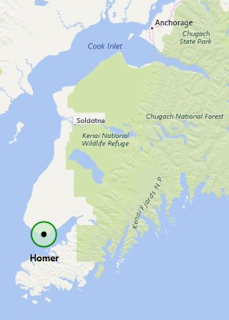 “Some people prefer the Tribune, some prefer the Homer News, some of us prefer to have access to both newspapers,” Jan Knutson, coordinator for the Homer Chamber of Commerce, told Daysha Eaton of KBBI in Homer, part of Alaska Public Media. The Tribune went online-only in June, but returned to print this month after it was bought by Alaska Media LLC, which also owns The Arctic Sounder and the Bristol Bay Times-Dutch Harbor Fisherman. The News is owned by Georgia-based Morris Communications, which also owns the Juneau Empire. "The Tribune plans to maintain a content-sharing agreement with Alaska Dispatch News," formerly the Anchorage Daily News, Eaton reports. "The parties have not disclosed the purchase price." The costs of attending a community college differs dramatically across the nation, as does the state aid students and schools receive, says a report by the Urban Institute and American Association of Community Colleges. 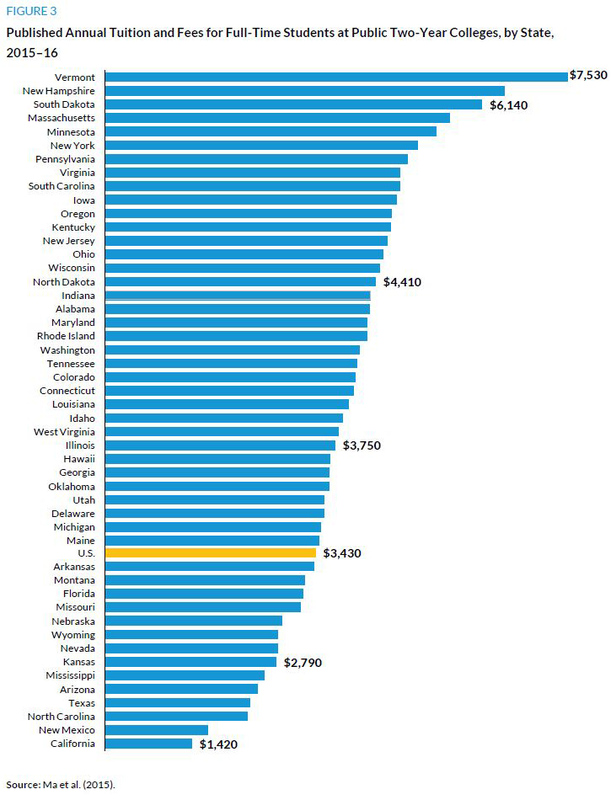 Tuition and fees are lowest in California, averaging $1,420 for full-time students, while Vermont has a high of $7,530, Smith writes. The national average is $3,430. In California, where about 60 percent of public college students are enrolled in two-year institutions, a high number of students "are eligible for tuition remission, versus a state like Vermont with high tuition costs." About 21 percent of of Vermont students are enrolled in a two-year college. Aid varies widely by state, Smith writes. "In South Carolina, for instance, the report details that 94 percent of first-time, full-time community college students are receiving grant aid, compared to 48 percent of students in New Hampshire." Steve Katsinas, director of the Education Policy Center at the University of Alabama, said some states have an apparent lack of inequality disparity, Smith writes. "Take Illinois, where state aid makes up less than 5 percent of Joliet Junior College's budget, but more rural Shawnee Community College in Southern Illinois receives about 40 percent of its budget from state investment. The higher education cuts in Illinois are more devastating to colleges that rely on more state aid, he said." Katsinas told Smith, "It's possible that it's part of the discontent that we see reflected in the 2016 elections. In a lot of rural areas it might be tied to the lack of community colleges' ability to provide training because they're so badly underfunded in these high-skill, high-wage areas like robotics ... allied health and nursing." The U.S. Department of Justice will phase out use of private prisons. 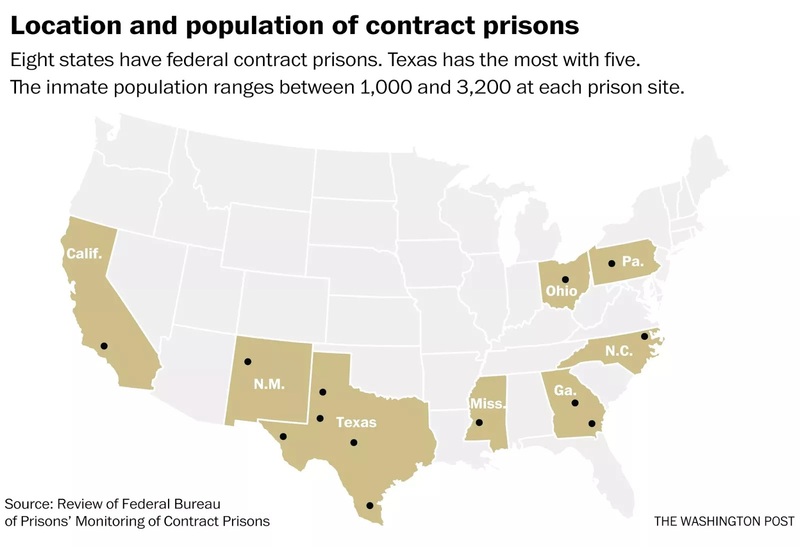 Its announcement followed an inspector general's report that said for-profit federal prisons, which are primarily located in rural areas, have a higher rate of safety and security incidents than non-contract institutions. The directive does not apply to state prisons or to Immigration and Customs Enforcement and Marshals Service detainees, but would affect 13 prisons in eight states that house 22,000 inmates, Matt Zapotosky and Chico Harlan report for The Washington Post. Deputy Attorney General Sally Yates said the goal is “reducing—and ultimately ending—our use of privately operated prisons. They simply do not provide the same level of correctional services, programs, and resources; they do not save substantially on costs; and as noted in a recent report by the Department’s Office of Inspector General, they do not maintain the same level of safety and security." Gov. Matt Bevin speaks as Medicaid advisers listen. 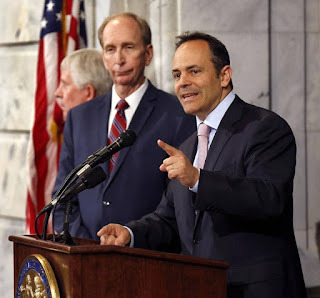 The new Kentucky governor, a Republican who first said while campaigning that he would abolish the Medicaid expansion of his Democratic predecessor, now wants to require able-bodied adults in the expansion to do volunteer work. That isn't sitting well with the Kentucky Nonprofit Network, which represents nearly 600 of the state’s nonprofit groups, because it would mean tens of thousands of people would "need training, supervision and—in some instances—criminal-background checks," John Cheves reports for the Lexington Herald-Leader. As part of the state's request for a federal waiver to tighten eligibility standards for the 440,000 Kentuckians who obtained health insurance through the expansion, one of the requirements Bevin "wants to include is 'community engagement' for able-bodied adults, requiring them to work, search for a job, be enrolled in classes or volunteer in their communities in order to remain in Medicaid. The state estimates these requirements could affect roughly 215,000 people," many of whom live in rural areas, some with few volunteer opportunities. Danielle Clore, executive director of the Kentucky Nonprofit Network, "said members of her organization have limited budgets," Cheves writes. "Many cannot afford to manage a much larger staff. Some do not have enough space or work for so many additional people, Clore said. In sparsely populated rural counties, only a handful of nonprofit groups operate, she said. And some groups that work with children or the elderly require volunteers to pass a criminal-background check, which costs money and raises questions for Medicaid recipients with legal problems in their past, Clore said." A documentary on the life of Harry Caudill, whose 1962 book Night Comes to the Cumberlands helped spark the War on Poverty, the Appalachian Regional Commission and an era of activism in the region, is making the rounds. Harry Caudill: Man of Courage drew a good crowd at the Grand Theater in Frankfort, Ky., Aug. 18. Caudill's oldest son, James Caudill, said it was gratifying and encouraging to see public interest in his father's issues, such as strip mining, which is much more regulated these days but still a major environmental issue in the region. "Nothing fundamental has changed," he told the crowd after the showing. "Things have changed in small ways, but they are superficial." Caudill's book "drew national attention to the plunderous activities of the coal industry in Central Appalachia and the devastation it left," writes John Cheves of the Lexington Herald-Leader. "The book helped bring new environmental and property-rights laws, a massive increase in federal aid to the region and an influx of idealistic young people, some of whom still live in the mountains as idealistic old people." Cheves and Bill Estep did a five-story biography of Caudill as part of a Herald-Leader series in 2012-13 that looked at Central Appalachia on the 50th anniversary of the book's publication. The 17 indicators are: Data Completeness; Disability- or Illness-related Voting Problems; Mail Ballots Rejected; Mail Ballots Unreturned; Military and Overseas Ballots Rejected; Military and Overseas Ballots Unreturned; Online Registration Available; Postelection Audit Required; Provisional Ballots Cast; Provisional Ballots Rejected; Registration or Absentee Ballot Problems; Registrations Rejected; Residual Vote Rate; Turnout; Voter Registration Rate; Voting Information Lookup Tools Available; Voting Wait Time. North Dakota, which has topped the last four indexes, was given a score of 84. Minnesota was second at 83, followed by Virginia and Wisconsin (82), Connecticut (81) and Colorado and Delaware (80). Alabama scored 49. Also scoring low were California (54), Oklahoma and Idaho (57) and Arkansas, Hawaii and Mississippi (59). But Trump has done little to woo Latino voters, as evidenced by a Fox News Latino poll that showed 60 percent of Hispanics identify with Democrats and 21 percent with Republicans, O'Keefe writes. Third Annual Appalachian Food Summit will be held Sept. 16-17 in Berea, Ky.
For the first time in modern history, "the most common living arrangement for young adults" — 18 to 34 — is living with at least one parent, according to a study published earlier this year by the Pew Research Center, reports Tim Henderson of Pew's Stateline. Almost a third of young adults lived with a parent in 2014, Henderson reports, citing reasons: high housing costs, student debt, cultural norms among families and ethnic groups, and the lingering effects of the Great Recession. Debbie Pincus, a psychotherapist who has counseled parents and adult children who live together in New York, told Henderson that baby boomers "are very protective of [their] children" and are less likely to put them out. 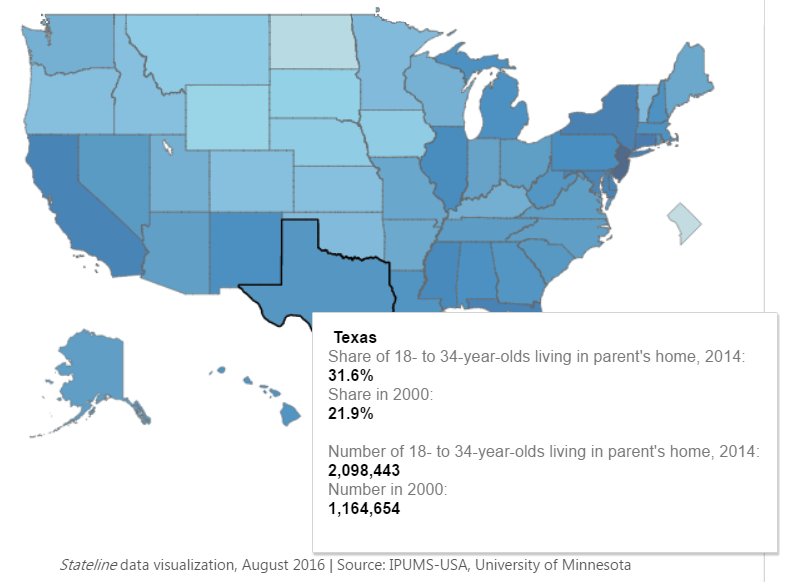 Among the states, New Jersey tops the list with 43.9 percent of young adults living with at least one parent, according to a Stateline analysis of 2014 census data from the University of Minnesota. Connecticut (38.8 percent) ranked second and New York (37.4 percent) was third. 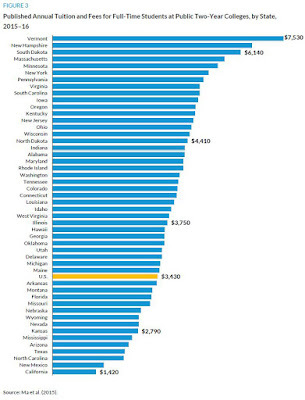 States with the fewest young adults living with a parent were North Dakota (15.6 percent), Wyoming (18.7 percent), South Dakota (19.7 percent) and Nebraska and Iowa (both 20.7 percent). Several states with high percentages of rural population, such as Kentucky and the Dakotas, had low percentages of millennials living with parents, but some other heavily rural states, such as Mississippi and some New England states, ranked high on Stateline's millennials-with-parents interactive map. Dowell Myers, a University of Southern California professor who has studied the economic impact of stay-at-home millennials, "predicts that a coming dip in the number of young adults may allow a greater percentage of them to finally find their own housing," Henderson reports. "The number of 25-year-olds has increased every year since 2005, but is projected to start decreasing next year and for the next five years. That’s likely to free up apartments and jobs for younger people at an increasing rate until 2022." Across Central Appalachia, especially Eastern Kentucky, "elected officials, business leaders, environmentalists and community advocates are looking beyond politics to wrestle with a question essential to the region’s survival: What comes after coal?" Sheryl Gay Stolberg reports for The New York Times. Lora Smith, who oversees grants in Central Appalachia for the Mary Reynolds Babcock Foundation, agreed with Ben Spangler of the Whitesburg media-and-arts cooperative Appalshop, who wrote that "Central Appalachia is presently in a strange place as the collapse of the coal industry leaves the region in an historical moment of terrifying liberation," saying that it can be liberating to imagine what the future holds. Startups have begun addressing some employment needs by training displaced coal miners in coding, Stolberg reports. 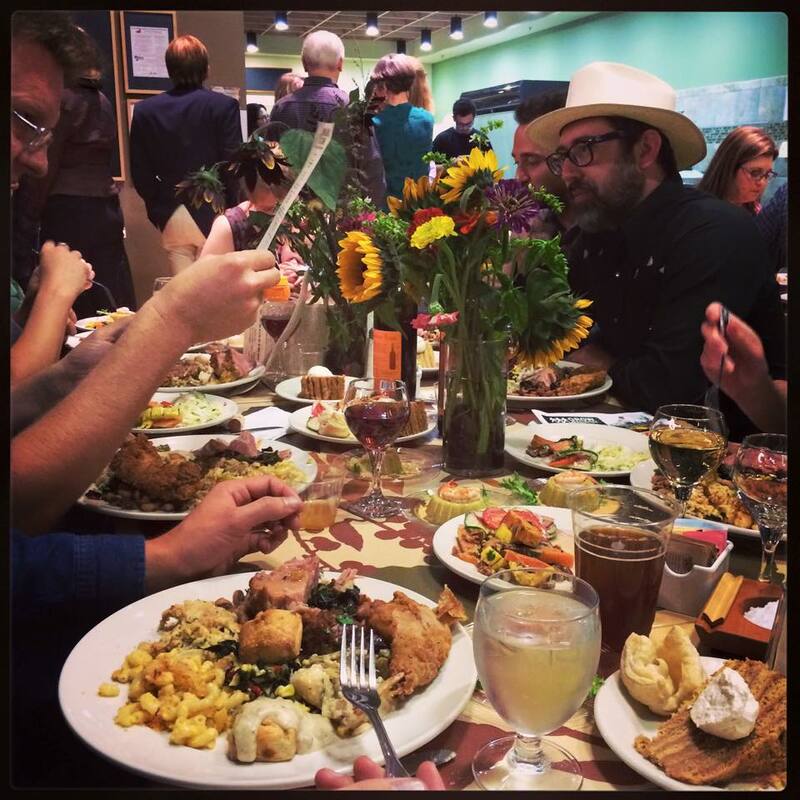 Many rural towns have begun creating tourism projects, finding ways to create small businesses—often run by young entrepreneurs—are trying to turn Appalachian food trends into profits, offering training in the growing teleworks field and are making efforts to make the region more energy efficient to save residents costs in utilities. Martin Richards, who runs Kentucky’s Community Farm Alliance, said many unemployed Eastern Kentucky residents "are increasingly turning to farming 'out of necessity'," Stolberg writes. Richards, whose group works with eight farmers’ markets in Eastern Kentucky, said the number of farmers’ markets participants has doubled in the past five years. 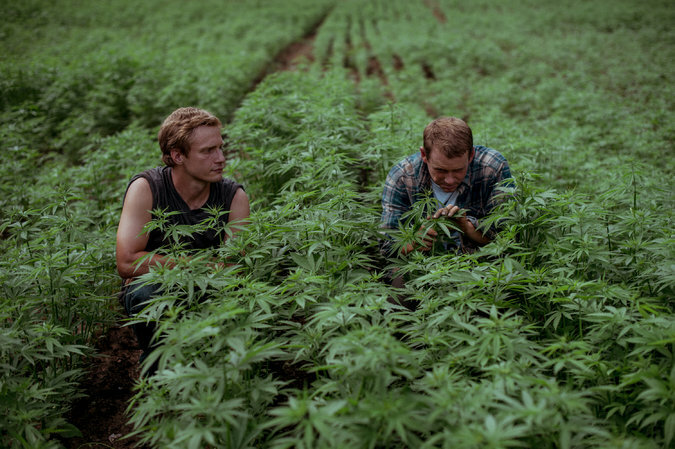 With Congress in 2014 allowing Kentucky to grow industrial hemp, that has also become a growing business within the state. 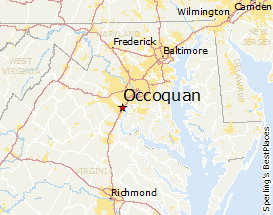 The rural town of Occoquan, Va. is overrun with players. The global phenoenon of the Pokémon Go game is disrupting some rural towns and creating safety hazards. Game players have been linked to car accidents, injuries, robberies, sexual assaults, and even a death in Guatemala, after a user was shot and killed by a homeowner after breaking into a house to catch a Pokémon, Ryan Miller reports for USA Today. Signs of disrespect abound, along with safety concerns. A Central Kentucky cemetery has posted notice that play is prohibited inside its grounds. The United States Holocaust Museum in Washington, D.C., has asked players to stop searching for Pokémon inside the museum, Andrea Peterson reports for The Washington Post. The Pentagon has banned use of military phones to play the game, Andrew Tilghman reports for Military Times. The mayor of a rural French town has banned the game, saying it puts drivers and pedestrians as risk, Philippe Sotto reports for The Associated Press. In India, where the game has yet to be released, a public-interest group has called for the game to be banned, fearing it will cause traffic accidents, Raymond Ronamai reports for International Business Times. Occoquan, Va., a 300-year-old historic riverfront town of 1,016 residents just off Interstate 95, "has unwittingly become a hotbed for the game," Perry Stein reports for the Post. "A place that touts itself as 'an oasis and a little-known gem' offering 'that personal touch of Main Street USA' has transformed into a virtual-reality superhighway. Occoquan’s newfound popularity has been a boon for the quaint restaurants and shops that line the town’s three-block main strip, as any kind of tourism brings in business. But residents in the D.C. suburb are now complaining that Occoquan has lost its quiet vibe, and town officials are scrambling to figure out how to keep everyone safe." What makes Occoquan a popular Pokémon destination is that it's a town on the banks of the Occoquan River, "home to both land and water creatures in the game." Stein writes. "Occoquan is filled with restaurants and shops, and by virtue of its centuries of history, it is lined with historical markers; these are spots conducive to housing lots of Pokémon, something that is a rarity in most suburban and rural areas. And it’s just 11 miles south of the Capital Beltway along I-95, making it central to many commutes and a short drive from the District." Playing of the game in Occoquan has led to the unusual sight of traffic jams during the day and pedestrians wandering the streets at 2 a.m., Stein writes. 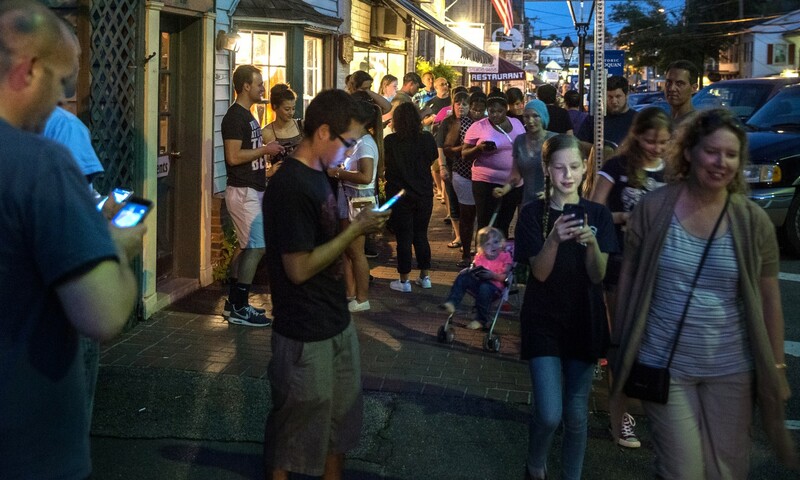 "Occoquan’s denizens are ­demanding a way to make it all stop. They speak of parents struggling to put young children to sleep because of all the Pokémon-related chatter outside their homes, and they worry about the drivers who have been playing Pokémon Go while behind the wheel, careering down one-way streets in the wrong direction. 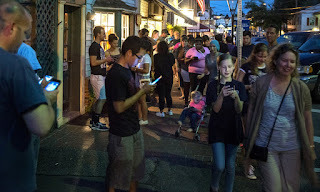 Occoquan’s leaders have put up signs around town warning people not to 'Pokémon and Drive' in an attempt to keep pedestrians who are staring at their phones safe from drivers who are doing the same." 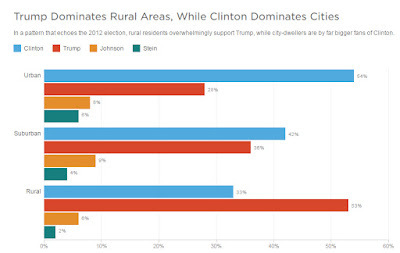 It's been well reported that rural areas—which tend to be whiter, older and less educated—are more conservative and favor Republican candidates like presidential nominee Donald Trump, while Democratic candidates such as presidential nominee Hillary Clinton are more popular in urban areas. "All these stats might make it seem that it's demographics that cause rural voters to choose Trump, or other Republican candidates: that there's something about being white or about being older or not having a college diploma that makes a person vote for him, and that those people also just happen to live in rural areas," Danielle Kurtzleben reports for NPR, in a story with lots of charts. "Or, perhaps, that there's something about being conservative that makes a person choose a rural area." She notes that the Pew Research Center "has found that (for whatever reason) people who are conservative prefer places where the population is more spread-out, while liberals prefer denser neighborhoods." Cramer has labeled these intense, negative feelings rural residents have against people in the cities, "rural resentment," Kurtzleben writes. Cramer has studied how Republican Gov. 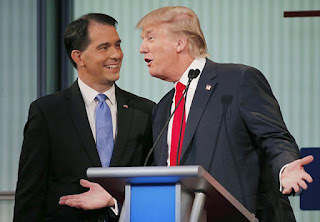 Scott Walker of Wisconsin appealed to rural voters. In an April column she wrote for USA Today, she said Walker found success by appealing "to rural voters by talking about getting their roads fixed, as opposed to spending on high-speed rail between big cities. Walker also ran against government and public employees in Wisconsin. Those workers often were higher-income than their peers, and with more generous benefits, so for non-public sector workers in rural communities, that was another source of resentment." Cramer said Trump's rhetoric may similarly appeal to America's rural populations. She told Kurtzleben, "The resources, the people, the respect seem to be going somewhere else, or to other types of people, and here comes someone who says 'You're right, you're not getting your fair share. It's going to people who aren't deserving, and you vote me in and were going to make America great again." The Environmental Protection Agency needs to revise its June 2015 study that said no evidence exists that horizontal hydraulic fracturing operations cause widespread damage to drinking-water supplies, said a report from the Science Advisory Board, an EPA panel that conducted a yearlong analysis of the study's results. "The panel said the report's core findings 'that seek to draw national-level conclusions regarding the impacts of hydraulic fracturing on drinking water resources' were 'inconsistent with the observations, data and levels of uncertainty' detailed in the study," reports Neela Banerjee of InsideClimate News. Of particular concern, the panel said, "was the report's overarching conclusion that fracking has not led to 'widespread, systemic impacts on drinking water resources in the United States'," Banerjee reports. "The panel said that EPA did not provide quantitative evidence to support the conclusion." The panel wrote to EPA Administrator Gina McCarthy: "SAB recommends that the EPA revise the major statements of findings in the executive summary and elsewhere in the final assessment report to clearly link these statements to evidence provided in the body of the final assessment report." Environmentalists welcomed the panel's report, saying they hoped it would lead to changes in the original report's conclusions, Banerjee writes. Industry group Energy in Depth responded by maintaining "that the draft study's topline claims on fracking's water pollution stand." Industry groups had seized upon the 2015 report "to back its contention that fracking does not pose a threat to water," Banerjee reports. Texas leaders want the U.S. Supreme Court to decide the fate of the state's controversial voter-ID law, Jordan Rudner reports for The Dallas Morning News. Texas Attorney General Ken Paxton's office announced on Tuesday it is filing an appeal with the high court to keep the law in place. Last month the U.S. Fifth Circuit Court of Appeals ruled that the 2011 law—which stipulates the types of photo identification election officials can and cannot accept at the polls—does not comply with the Voting Rights Act. Last week a federal judge ruled that Texans will not be required to present an ID in order to vote in the November general election. Corey Lequieu on Tuesday became the first defendant in the January armed takeover of the Malheur National Wildlife Refuge in Oregon to be sentenced to prison, receiving 2½, Rebecca Woolington reports for The Oregonian. 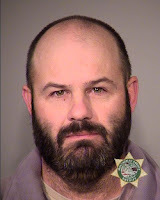 His prison term will be followed by three years of supervised release. He also must pay restitution in an amount to be determined later. Of the 26 defendants, 10 have pleaded guilty. Lequieu, who was charged with conspiracy, "admitted to impeding federal employees through threats, intimidation or force from working at the refuge outside Burns," Woolington writes. While the charge carries six years, "federal prosecutors recommended that Lequieu serve less time as part of a plea agreement and under sentencing guidelines. Assistant U.S. Attorney Craig Gabriel said the government considered that Lequieu was the first in the case to take responsibility when making the offer." "Lequieu's defense attorney, Ramon Pagan, told the court that he and his client were grateful that they reached an agreement with the government without Lequieu agreeing to testify against other defendants in the case," Woolington writes. 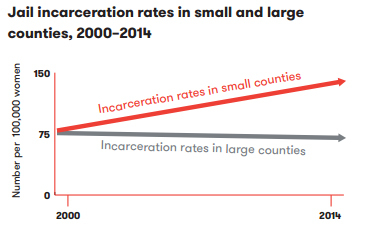 Overall, 82 percent of women are incarcerated for non-violent offenses, the report states. Thirty-two percent for property offenses, 29 percent for drug offenses and 21 percent for public order offenses. "Most have been charged with low-level offenses, including drug or property crimes like shoplifting, but a growing number are in jail for violating parole or probation, for failed drug tests or for missing court-ordered appointments," Williams writes. "Others are unable to make bail or pay court-mandated fees and fines, the report said." "The study found that women accounted for 26 percent of total arrests in 2014, compared with 11 percent in 1960," Williams writes. "And the most common offenses that led to arrests involved drugs. 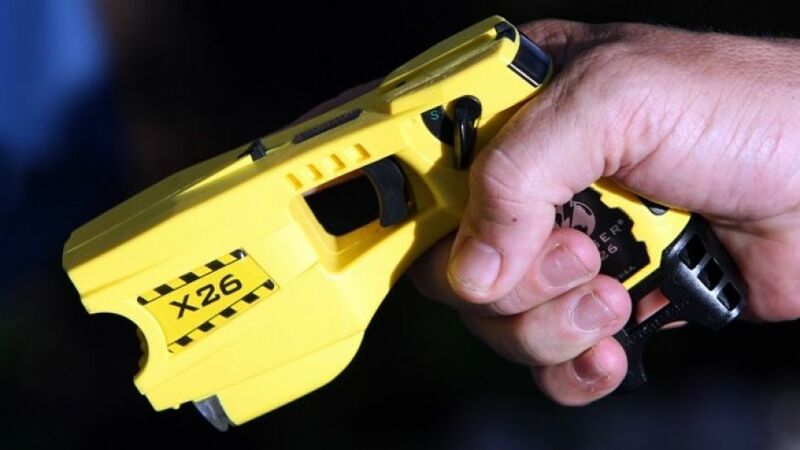 Between 1980 and 2009, the arrest rate for drug possession or use doubled for men but tripled for women, according to the Bureau of Justice Statistics." On Aug. 1 a Texas law went into effect allowing "anyone with a concealed handgun license in Texas to carry their weapons in most buildings, including classrooms and dining halls," Matthew Watkins and Madeline Conway report for The Texas Tribune. Private universities are allowed to opt out of the law, and all but one of the state's 37 private institutions have done so. The one school to allow guns, Amberton University, is a mostly online school for adults 21 and over that does not have any dorms, social clubs, sports teams or dining halls. Three University of Texas professors who have sued for the right to ban guns in their classrooms were told last week that they will be punished if they attempt to do so, Lauren McGaughy reports for The Dallas Morning News. The professors argue that the state law doesn't explicitly forbid them from banning weapons. The schools' lawyer wrote in a legal brief, "Faculty members are aware that state law provides that guns can be carried on campus, and that the president has not made a rule excluding them from classrooms. As a result, any individual professor who attempts to establish such prohibition is subject to discipline." Colorado, Idaho and Utah have laws allowing concealed guns on campus, but higher education institutions are allowed to ban weapons in certain areas such as dorms, dining halls and event centers, according to Armed Campuses. Tennessee, which allows residents to carry concealed guns, "prohibits a person to possess or carry, whether openly or concealed, any firearm, not used solely for instructional or school-sanctioned ceremonial purposes, on any public or private school campus, grounds, recreation area, athletic field or any other property owned, used or operated by any board of education, school, college or university board of trustees, regents or directors for the administration of any public or private educational institution." In Oregon, Kansas, Wisconsin, Arkansas and Mississippi concealed guns are allowed by law, but schools limit locations and who carries them, states Armed Campuses. Many states allow schools to decide their own policies, while other states only allow guns in locked cars in parking lots. Only a handful of states prohibit concealed guns on campus. How about some Asian carp for dinner? If you can't beat invasive Asian carp, then eat it. 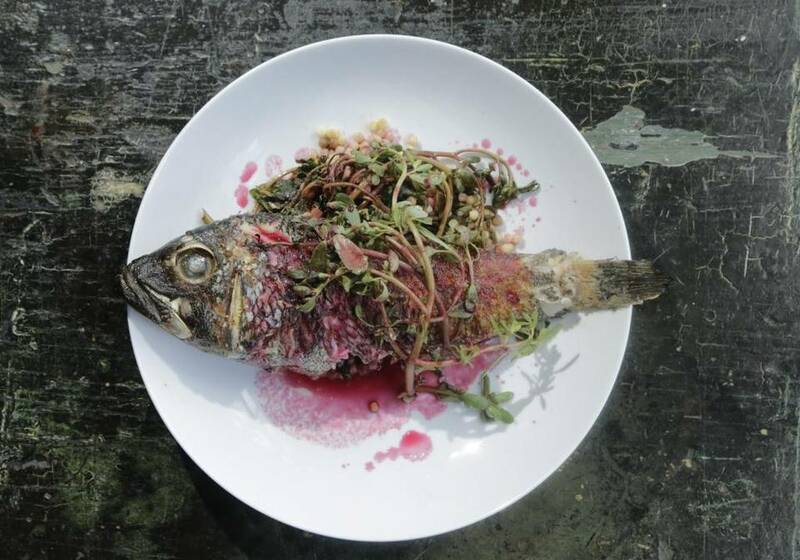 Some Kentucky restaurants are banking on Asian carp dishes, and Indiana has begun a campaign to promote eating the fish in the Hoosier State. A study in Minnesota found that 19 percent of the state's mental-health beds are used by patients who could have been treated in a different setting, reports the Minnesota Hospital Association, which commissioned the study by the Wilder Foundation. Conducted from March 15 to April 30, the study of 20 hospital —half of them in rural areas—found that "of the 32,520 total mental-health bed days in all participating hospitals, 6,052 were identified as potentially avoidable." 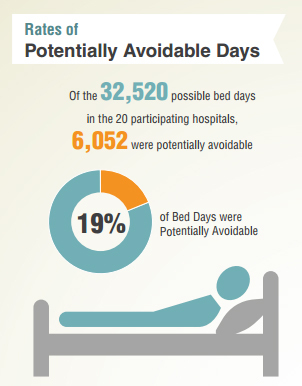 That translates to approximately 48,000 potentially avoidable days in a year. Nationwide, the number of psychiatric beds has dropped 13 percent since 2010, reports Michael Ollove for Stateline. The number of psychiatric beds in Minnesota dropped from 206 to 194 during that time. That's an average of 3.5 beds per every 100,000 residents, the second lowest total in the nation, behind Iowa, which has 2 beds per every 100,000 residents. The national average is 11.7 beds per every 100,000 residents. Many state and local courts fail to use qualified translators and ignore federal rules for when interpreters are required, Rebecca Beitsch reports for Stateline. The result is that "many criminal defendants and civil litigants with limited English skills are not equipped to navigate the complex legal system, jeopardizing their constitutional rights." Since 2010 the U.S. Department of Justice "has investigated courts in Colorado, Hawaii, Kentucky, New Jersey, North Carolina and Rhode Island for failing to comply with federal rules.eight states don’t certify court interpreters," Beitsch writes. 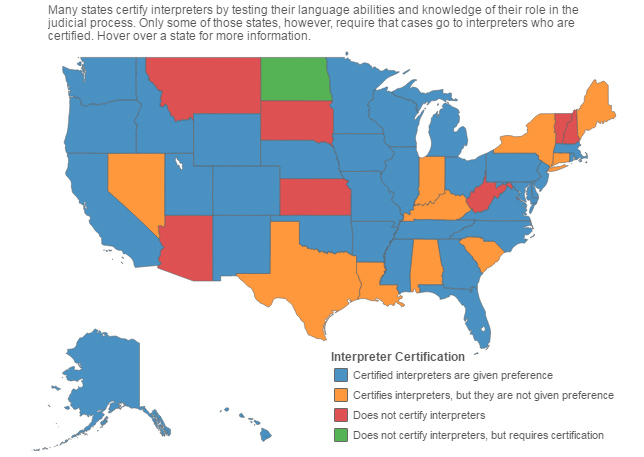 Eight states don't certify court interpreters and in 32 of the states that do, interpreters say those states don't follow policies giving preferential treatment to those who are certified. Federal school-meal programs may have contributed to obesity among financially vulnerable children from 1998 to 2007, according to a study by Virginia Tech researchers published in Health Economics. The data preceded changes to the meal program in 2010, but researchers said the results "shed light on the magnitude of needs for nutrition improvement for the school meal programs before" that year's Healthy, Hunger-Free Kids Act. The study followed 21,260 students from kindergarten through eighth grade and compared eligible students who participated in the program to eligible students who chose not to participate. The largest effect of the program "is on those students living in rural areas," the researchers wrote. They also found that low-students in low-income families and those in the Northeast and South, as well as rural children, "are most susceptible to the problem," Amy Loeffler reports for Virginia Tech. "The study found that these children consume one-third to one-half of their daily meals at school." Using body-mass index, a measure of obesity, researchers found that "children who were most likely to be overweight came from families who participate in both the school breakfast and lunch programs consistently throughout their elementary and intermediate school years," Loeffler writes. Researchers also "confirmed the short-term risk of being overweight imposed by the school lunch program." The study was funded by the Department of Agriculture, which runs the program. The researchers said they considered socioeconomic factors, such as gender, race/ethnicity, age, weight, whether the school is Title I (high-poverty), number of students eligible for free or reduced-price meals, household income, parents' education level, whether or not the mother works full-time, whether or not the parents are married, numbers of meals families eat together, whether or not families are food-insecure, and urbanity. Researchers said they were unable to control for parents' weight, what students ate outside school and more accurate indicators of their physical activity, which could affect weight. The researchers said more study is needed to gauge the effect of changes in the program, and also because its recent Community Eligibility Provision allows schools with certain levels of low-income households to make all students eligible for the program, regardless of income. Though the researchers made clear that their data proceeded President Obama's election and his wife's campaign to improve school meals, conservative information outlets "have been having a field day" with the study, with headlines blaming Michelle Obama for "making kids fat," Helena Bottemiller Evich reports for Politico. Researchers have identified the sources of more than 250 leaks emitting the greenhouse gas methane in the Four Corners area where New Mexico, Colorado, Utah and Arizona meet, said a study published Monday in Proceedings of the National Academy Sciences. The study was conducted by the same researchers who in 2014 published a study saying methane leaks in the region were 80 percent higher than Environmental Protection Agency estimates. Researchers, who in 2014 said they were unable to pinpoint the exact sources of the runaway gas, said they were able to do so with the new study by using "aircraft sensors allowing them to pinpoint the source of leaks within a few feet," Phil McKenna reports for InsideClimate News. "The earlier paper relied on less precise, region-wide satellite data." Lead author Christian Frankenberg, an environmental science and engineering professor at the California Institute of Technology, told McKenna, "It's good news, because with the techniques that we have developed here, it's possible to find the dominant leaks that we can target for methane emissions mitigation,"
The Four Corners region, which spans more than 1,000 square miles, "is one of the nation's largest producers of coal-bed methane and releases about 600,000 metric tons of methane into the atmosphere each year," McKenna writes. "The study is the latest to show that a small number of 'super-emitters,' mainly from oil and gas operations, are responsible for the majority of U.S. methane emissions." 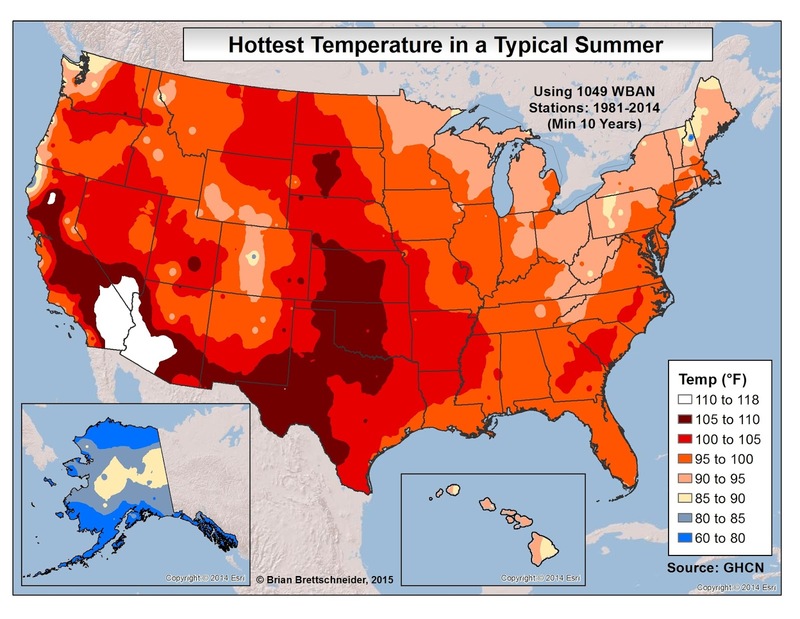 July also was the 10th record hot month in a row, according to NASA, Borenstein writes. 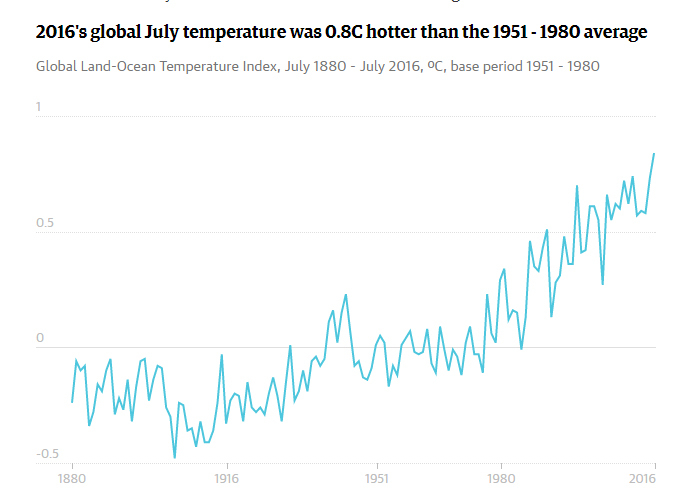 "The National Oceanic and Atmospheric Administration, which calculates temperatures slightly differently, will come out with its July figures on Wednesday. 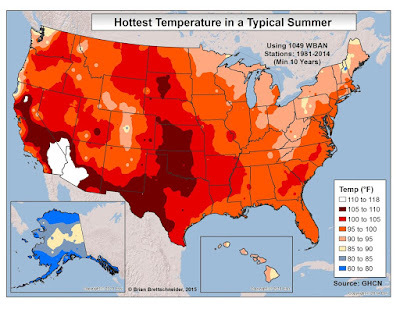 NOAA has figured there have been 14 monthly heat records broken in a row, before July. 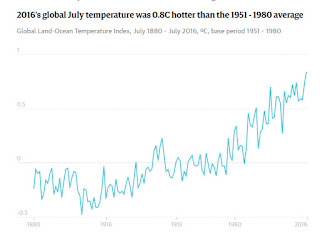 NASA’s five hottest months on record are July 2016, July 2011, July 2015, July 2009 and August 2014." Many U.S. prisons and jails, often located in rural areas, lack air conditioning. That's caused growing concern "about the threshold for when extreme temperatures become cruel and unusual punishment," Alan Blinder reports for The New York Times. "Judges from Arizona to Mississippi to Wisconsin have declared over the years that the Eighth Amendment to the Constitution forbids incarceration in decidedly hot or cold temperatures. Still, prison-reform activists encounter deep resistance in their quest to cool the nation’s cellblocks." "The disputes surrounding the climate of modern incarceration can be partly traced to 1981, when the Supreme Court concluded that 'the Constitution does not mandate comfortable prisons,'" Blinder writes. " About 35 years later, states, counties and cities are interpreting the court’s words in their own ways. In Texas, state regulations require that temperatures in county jails 'shall be reasonably maintained between 65 degrees Fahrenheit and 85 degrees Fahrenheit in all occupied areas.' But that standard does not apply to state prisons." On Friday a federal judge blocked a Texas law "that limits the availability of interpreters in polling places, ruling that it violates protections guaranteed by the U.S. Voting Rights Act," Chuck Lindell reports for the Austin American-Stateman. An India-born woman had filed a lawsuit in 2014 after her local polling place refused to allow her son to interpret for her, because he was registered to vote in a different county. A state election law "requires interpreters to be registered to vote in the same county as the person they intend to help." Texas also been criticized for its voter ID law, which some say discriminates against immigrants, many of whom are prone to vote Democrat. For-profit federal prisons, which are primarily located in rural areas, have a higher rate of safety and security incidents than non-contract institutions, says a U.S. Department of Justice inspector general's report. Many of the inmates are Mexican and are serving time for immigration offenses, including "almost 22,700 low-security immigrant adult males with 90 months or less on their sentences," Joe Davidson writes for The Washington Post. The three companies—Corrections Corporation of America (CCA), GEO Group, Inc. and Management and Training Corporation (MTC)—that contract the for-profit prisons all "cited their largely homogeneous inmates as a significant factor in prison misconduct." 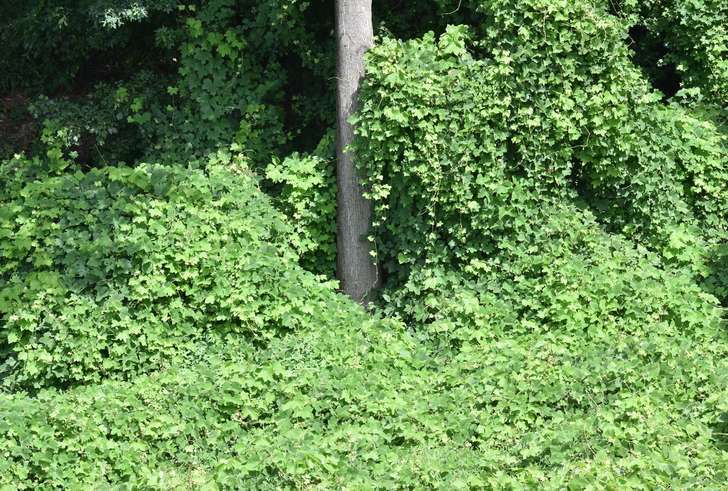 "Kudzu covered only 227,000 acres of Southern forests in 2010, according to the U.S. Forest Service, a remarkably reduced amount of territory compared with previous years," Chapman writes. Scientists say Japanese honeysuckle—which covered 10.3 million forested acres in 2010 and spreads roughly 65,000 acres each year—and other invasive species, such as "Cogon grass, Chinese privet, English ivy, bamboo, tallow trees and other invasives occupy foresters more than kudzu." The Office of Surface Mining, Reclamation and Enforcement last week asked states to deny permits to companies that self-bond to guarantee that mined land will be reclaimed, Ken Silverstein reports for Environmental Leader. The reason is that many financial strapped companies—Alpha Natural Resources, Arch Coal and Peabody Energy have all recently declared bankruptcy—are in no position to cover the insurance necessary to guarantee they clean up the sites when they are done, meaning taxpayers end up footing the bill. The Natural Resources Defense Council says "almost $3.6 billion in self-bonds are outstanding from Alpha Natural Resources, Arch Coal, Cloud PeakEnergy and Peabody Energy," Silverstein writes. "Altogether, the U.S. has been working to clean up more than 500,000 acres that were abandoned before the bonding law took effect in 1977 at a cumulative cost of potentially $12 billion." Republican presidential nominee Donald Trump has opened the door for Democrat Hillary Clinton to win over rural voters who typically support the GOP, Agriculture Secretary Tom Vilsack told former Obama campaign strategist David Axelrod on "The Axe Files," a podcast produced by CNN and the University of Chicago Institute of Politics. 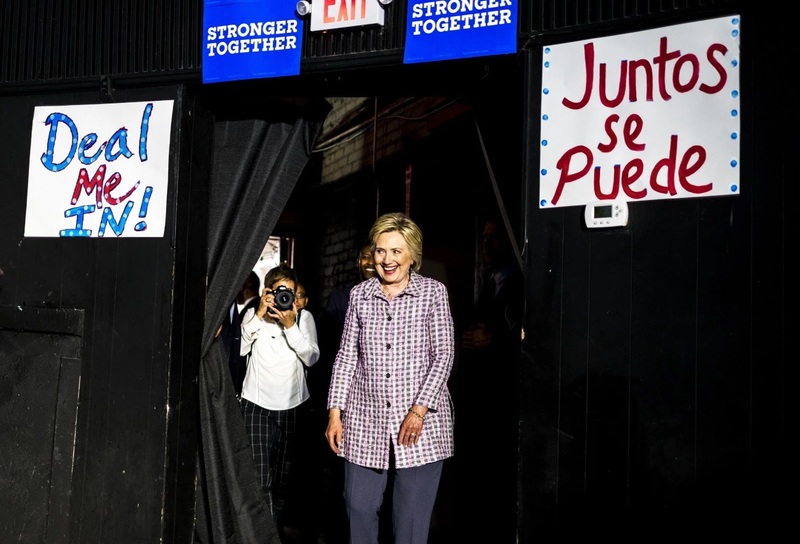 Vilsack, a former governor of Iowa, a battleground state, said Trump's disassociation from rural America has given Clinton "an opening to make a push for rural voters," Zane Maxwell reports for CNN. Vilsack said Trump's "notion of this country is not what I hear in rural areas. His notion of division is not what I hear from a lot of good people in these towns. With [Trump], people are saying, 'I'm really uncomfortable with him, so what's my option?' Well, if we don't speak to them, there is no option." 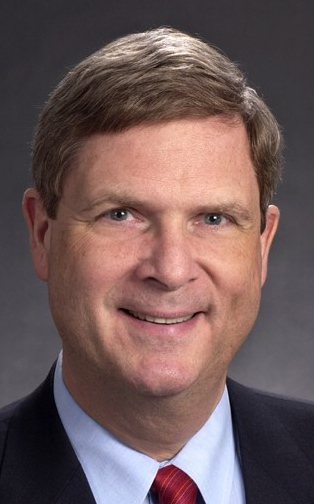 Vilsack said Democrats, who are mainly an urban party and sometimes oblivious to the value of rural communities, have a golden opportunity to seize rural voters' support. He told Axelrod, "The food we eat, the water we drink, the energy we use, and a significant percentage military we rely on comes from rural America. And those folks in those rural communities do not believe that there is a recognition or appreciation on the part of Democrats for that contribution to our country. We're in a position to say she listens. He doesn't listen; he listens to himself." The American Society of News Editors has adopted a resolution welcoming new laws in Illinois, Maryland and North Dakota that aim to protect the ability of college and high-school journalists to write about issues of public concern, and calls on all other states to follow their lead. “A free and independent student media is an essential ingredient of a civically healthy campus community, conveying the skills, ethics and values that prepare young people for a lifetime of participatory citizenship,” the resolution says. ASNE directors passed the resolution in response to Illinois' July 29 enactment of the Speech Rights of Student Journalists Act (HB 5902), making it the 10th state in the nation – and the third in the past 12 months – to enact statutory protection for student journalists "that goes beyond the minimal rights guaranteed to students under federal law," ASNE said in a news release. A national “New Voices” initiative is working with advocates in at least 19 other states to bring a more balanced approach to the oversight of student media, with bills now pending in Michigan, Minnesota and New Jersey. ASNE joins the Society of Professional Journalists, the National Council of Teachers of English and the Journalism Education Association in endorsing the movement.